This week, week 6, is an exciting week, I have moved cabins. Since the beginning of my challenge my living quarters have been at the front of the boat, in what we call The Girls Cabin. It’s officially known as the bow cabin and is the bigger of the 2 on board our beautiful boat. The Girls Cabin has got more head and leg space, it is sheltered from the rain and has more storage pockets and has been my home with Lesley for the last 5 weeks. We made it a home from home and created a synchronised routine allowing us to feel extremely comfortable in our 2m x 1m cabin. 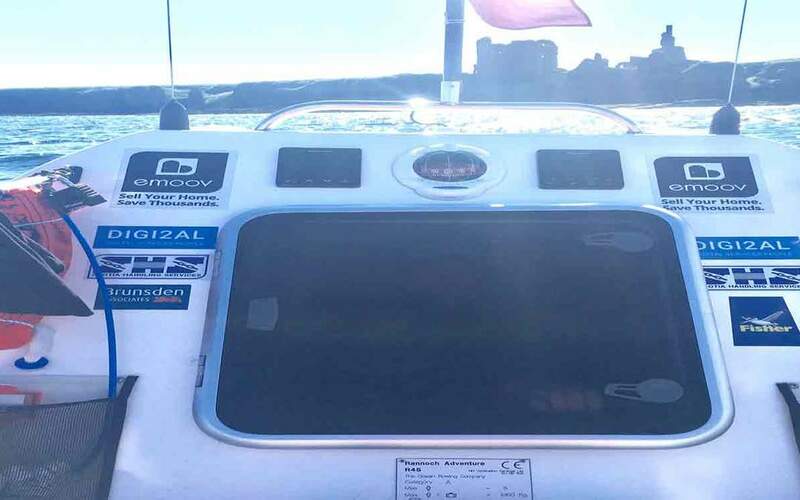 With a desire to learn more about navigation, the controls, electronics and also to put me a little outside my comfort zone, I packed my 2 bags of belongings and took a trip to the other end of the boat. No removal men required. The Boys Cabin has yet to be filled with oestrogen so I am feeling very honoured to be welcomed in. In fact, over the past few weeks I have occasionally sneaked up here and bombarded the boys on their break just to look at the controls. Plus I believe the smell of testosterone makes me stronger (winking smiley). 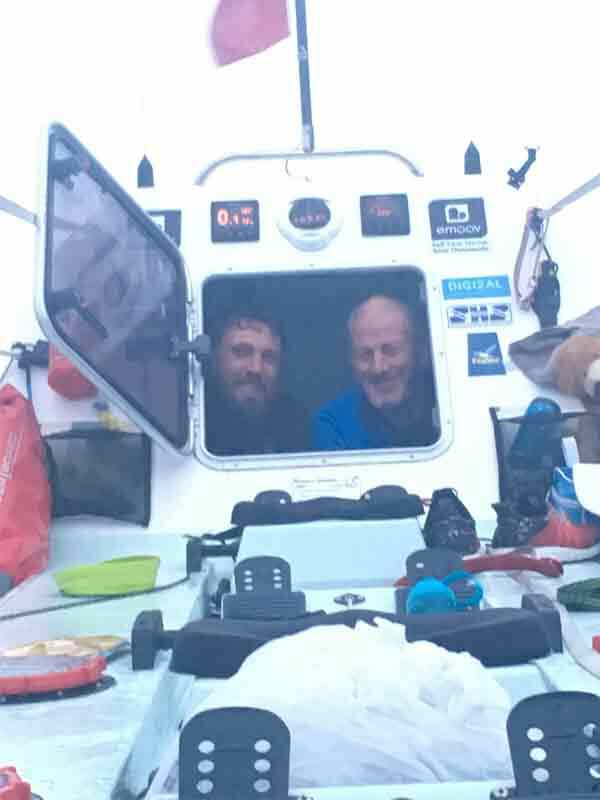 The 2 major changes about The Boys Cabin is it’s much ‘cosier’ and breaks in between rowing shifts are frequently interrupted. Laying down in here means threading our legs down one of the tunnels underneath the deck (see picture, as you can see, I didn’t tidy, I like to keep things authentic). Unlike The Girls Cabin which has a small shelter above the door and a footwell just inside, the Boys Cabin door is angled facing the sky. This makes getting in and out easier than if it was vertical, however it also means it’s tricky to keep the cabin dry. On day shift naps, the sun bursts through the door making sleeping a challenge. The limited storage space also means we’re often left twisted amongst and on top of our belongings. The biggest change in The Boys Cabin though are the interruptions. 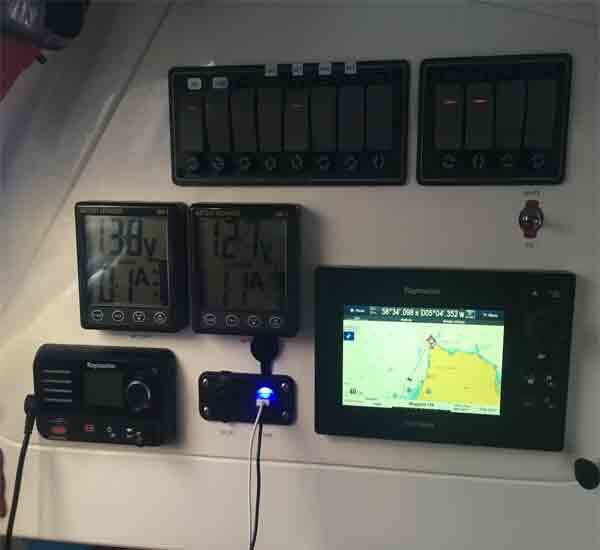 All the important gear is in here; the auto pilot which steers us, the chart plotter which is our map, the VHF radio, the batteries and the electric panel which controls everything on the boat. Believe me when I say it is not plain sailing. Frequently, the auto pilot can trip out in bad weather, strong tides or just because it wants too. This throws the boat off course and can sometimes leave us spinning in circles. 2 reasons this isn’t great; it won’t be the way we want to go and can also point us towards rocks, land or other dangers. When this happens it’s all systems go. 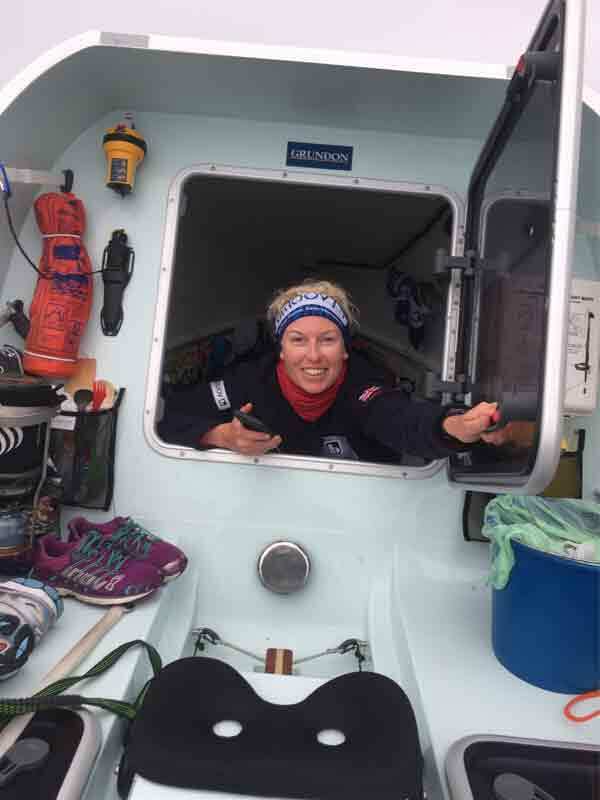 There is very little time to think, with the skipper shouting instructions on how to correct the situation. As buttons are pressed, the auto pilot is removed and paths changing, alarms go off on the controls which can add distress to the situation. It is very surprising how quickly things can go wrong out here. So far, I lived been in the Boys Cabin for 12 hours and I have experienced 2 incidents in my off- shift, the shifts where I am meant to be resting. As I write, I peer through the cabin door every few minutes to make sure we are on course, heading in the correct direction. It’s going to be a whole new ball game resting in here in the evening when visibility is limited and being woken up by a screaming skipper required me to act QUICKLY! One benefit of living in here is that I am able to sit up straight. Sitting up in the girls cabin means leaning against the side of the boat. This makes it unbalanced and tougher for the crew to row so we don’t do it. With no other option than to lie down in there, this often ends with me falling asleep even when I don’t want to sleep. I’m now using the back of the boat as a back rest, piling a few bags behind me for cushions. I get the joy of seeing where we are going instead of seeing where we have been which is a treat. I like it up here. I like small spaces. I like computers and I like learning. It turns out I also love ocean rowing. There’s even talk of me being up here again before the trip ends. Jolly good. After note: It has taken me 10 days to complete this post due to the disruptions that occurred in here. I didn’t get much rest in my off shifts, often being woken by alarms or having to steer us around headlands when the auto pilot tripped out. I now understand why our skipper is so shattered at the end of a weeks rowing and grabs as much sleep as they can. There is lots to think about! Thank you to Emoov for supporting my journey!